Work Sharp knife sharpener will give you the cutting edge you desire on your boning knives, breaking knives and hunting knives. 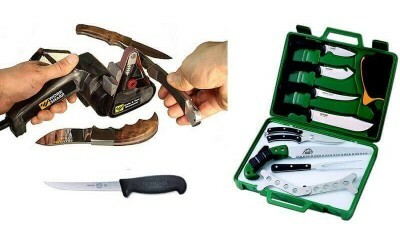 Outdoor Edge Game Processing Kit gives you all the tools for processing your big game at home. The Outdoor Edge Game Processor Kit is the most complete portable butchering set for preparing big game, waterfowl, wild turkey, small game and fish. This set also doubles as great set of cutting tools for outdoor cooking. Each knife incorporates full-tang construction for superior strength and is t..
5" Curved Semi-flexible Boning Knife for separating meat from bone. Victorinox® Knives from Forschner are renowned for their extremely sharp, high carbon stainless steel blades. Swiss made Victorinox® knives are the choice of professional chefs and meat cutters worldwide. Ergonomic Fibrox™ plastic h..
6" Straight Narrow Semi-flexible Boning Knife for separating meat from bone. Victorinox® Knives from Forschner are renowned for their extremely sharp, high carbon stainless steel blades. Swiss made Victorinox® knives are the choice of professional chefs and meat cutters worldwide. Ergonomic Fibrox™ ..
8" Breaking Knife for butchering large pieces of meat or cutting steaks.Victorinox® Knives from Forschner are renowned for their extremely sharp, high carbon stainless steel blades. Swiss made Victorinox® knives are the choice of professional chefs and meat cutters worldwide. Ergonomic Fibrox™ plast..